Readers have been asking if my forthcoming novellas LEGION and THE EMPEROR'S SOUL will be released in audio versions. The answer is that they will be—we have deals made for these, but I'm not sure how quickly the audiobooks will be released compared to the book versions. I'll let you know when I have more details. 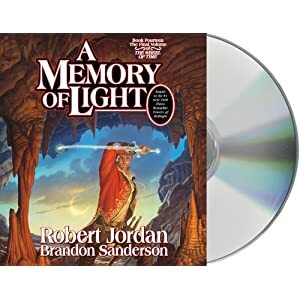 Another question commonly asked is whether Michael Kramer and Kate Reading will return to voice the audiobook for A MEMORY OF LIGHT. The answer is yes, and the audiobook will definitely be released the same day as the hardcover. All of my books are now out in audio editions, including the last three Alcatraz books that were missing audiobooks for a few years. There are two different kinds of audiobooks of mine that have come out: standard unabridged readings (from Macmillan Audio and Recorded Books) and full-cast dramatizations (from GraphicAudio). Which type each book has depends on how contracts were negotiated. Recorded Books has unabridged readings of Elantris, Warbreaker, and all four Alcatraz books. GraphicAudio has full-cast dramatizations of Elantris and Warbreaker. Macmillan Audio has unabridged readings of Mistborn 1, 2, 3 and The Alloy of Law; The Way of Kings; and The Gathering Storm and Towers of Midnight. Amazon has most of the above for sale. Audible has everything except for the GraphicAudio editions. iTunes also has many of the books. Tor.com has a free unabridged reading of the novelette "Firstborn."